Singolo Vino is proud to launch the Wigan Warriors Wine Club. Focused almost exclusively on the sports sector, Singolo Vino partners with teams across the United Kingdom to provide online wine clubs, so that supporters can enjoy an extensive range of exquisite wine at competitive prices, as well as enjoying discounts specific to their club. Wigan Warriors supporters will now have a quick and easy way to buy a superb selection of quality wines – hand-picked from independent wineries across the world. As an on-going commitment to supporting the club, Singolo Vino will also present an exciting social media content stream featuring former players, whilst providing champagne for the Man of the Match Award after each home fixture. Why choose to support the Wigan Warriors Wine Club? 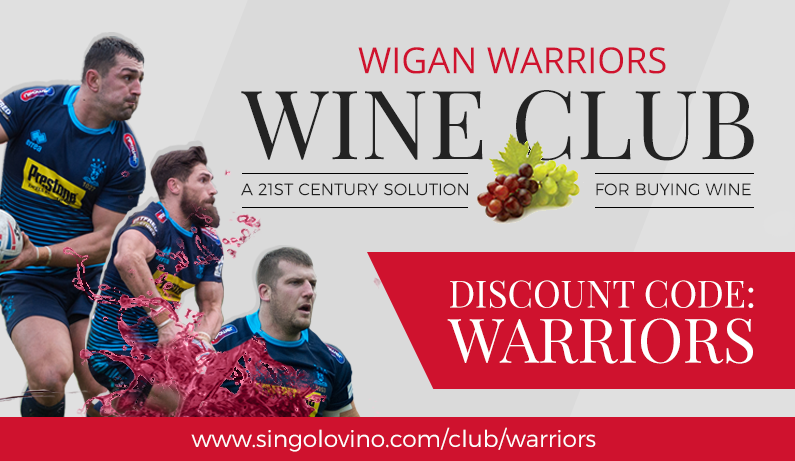 The Wigan Warriors Online Wine Club offers supporters a discount on all wine across the Singolo Vino range. To take advantage of this superb offer, please select Warriors as your club at the checkout. CLICK HERE to sign up.